My favourite leash for non-surfing activities is the Balin Downwinder calf/knee leash. But they are sold out in Europe. 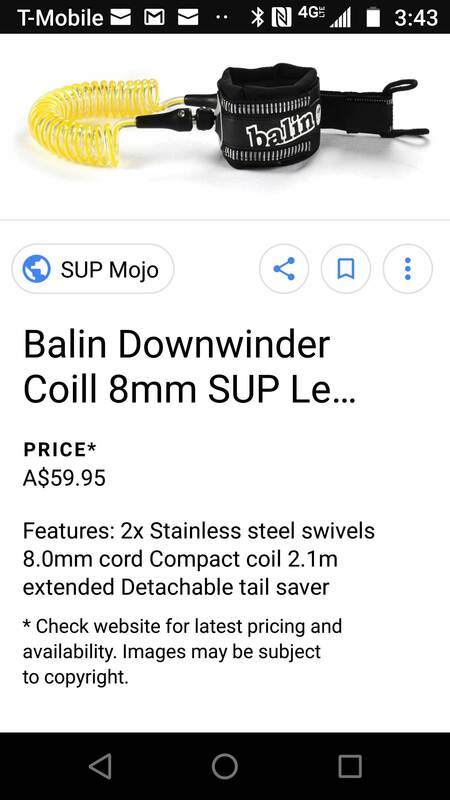 There's a Balin Monster Coil 8mm double swivel knee SUP leash 10ft available and the description of it (with 1m of straight section plus a coiled section) makes it sound very similar to the Downwinder. So what's the difference between these two? No-one here locally (in the UK) seems to know. Cheers for any info you have. Looked at the pic. Double swivel completely different than the Monster Coil Knee which is my all time favorite. Almost impossible to get here in the US. But I have a couple. Ok, so now I'm even more confused. I can't work out exactly what you are trying to tell me or show me. The picture you are showing me is not the same as the Balin Downwinder I have. We're you just showing me the Monster in the picture and then underneath the details for the Downwinder? The Balin DWer leash I already have has a coil plus a metre-long straight section and a calf leash. So, is this blurb wrong, and the Monster leash does not actually have the metre-long straight section? Or am I wrong, and the leash I actually have already isn't in fact a DWer, but a Monster? Pretty sure the Balin Downwinder Leash is a shorter 2.1 meter coil leash that has no straight section and mostly used on UL boards that have a front or back mounting point.. and race SUP boards.. and pretty sure it was originally designed as a ankle cuff leash but now available in both. The Balin Monster coil 3.1 meter SUP leash is the half straight and half coiled leash and was originally designed as a knee only cuff but they are also made in both. I helped them design this leash and my thinking was to have a coil that drops from your knee cuff to your ankle and a straight section that goes from there to the leash plug at the tail of the board.. so if there is any part of the leash that drags off the rail of the board and into the water its that straight section causing less drag than a coil leash.. and also if you were to step onto it it's only ever going to be the straight section of the leash because stepping on a coil is not nice. So.. although both knee and ankle cuffs are available I'd recommend the knee cuff. Pretty sure the one you have is the 8mm 3.1 meter Monster coil SUP leash. The 3.1m one with a straight bit is definitely the one to have for my UL DW boards. Has anyone here tried downwinding in strong winds with a 6ft coiled leash? I presume since it's only 6ft it might be designed to fasten to a front leash mount. What happens to the board if you wipe out in 35+ knots with a 6ft coiled leash fixed to the front of your board? It's dangerous enough sometimes on a UL board with a 12ft straight leash, even if you fall upwind. Maybe the Balin DWer leash is intended just for very mild winds and front leash mounts, or elite racers who never fall? I'm surprised that everyone else doesn't just use the Balin Monster Coil calf/knee for anything except surf. It's so good. If you were involved in the design of it DJ then respect to you. Thanks DJ for your reply. I have used my Monster Coil leashes on all of my surf sups as well as my raceboards. Even took one apart and connected it to a waist belt! Works a treat as you folks are inclined to say! Well it was time to think about replacing one of my leashes so I ordered a nice orange Monster Coil Balin leash. Expensive to get to Canada but I really like the design and look of it. To be soon connect to my LeashLok waist belt. You will enjoy it in the tropical waters of BC! Yep, they are a really excellent design - DJ did well. They are the best knee/calf leash for distance, DW and racing IMO. And I've tried a lot of different leashes.